This lesson is more about tweaking the hardware on your guitar rather than your chops. By knowing how to do this it will save you form having to stop by the music shop and being guitar less while the get around to doing this for you, and charging to $30 bucks or more. This is aimed at the Gibson style guitar that uses a Tune-O-Matic Bridge ans stop tail peace. This Lesson will show you how properly intonation your guitar. Intonation basically sets your guitar so that each note on each fret is in tune. There are some limitations because the frets are embedded in the guitar. What we are going to do to do a "Best Effort" to put your guitar in proper intonation. I would recommend doing this once a year or so and also if you drastically change string gages such as from 9's to 11's. Notice the little screws there. These screws will move the bridge that holds your sting forward (toward the neck) and back. Also there are screws on the side or in this case thumb wheel that will raise the bridge up and down. The best way to check your intonation is with a tuner on the octaves. For example play an open E on the 6th string, with a tuner make sure it's in tune, then move down to the 12th fret and play the E note still with the tuner. Is that E is tune or is it sharp or flat? Another aspect that is often over looked is action and height from the strings to the fretboard. 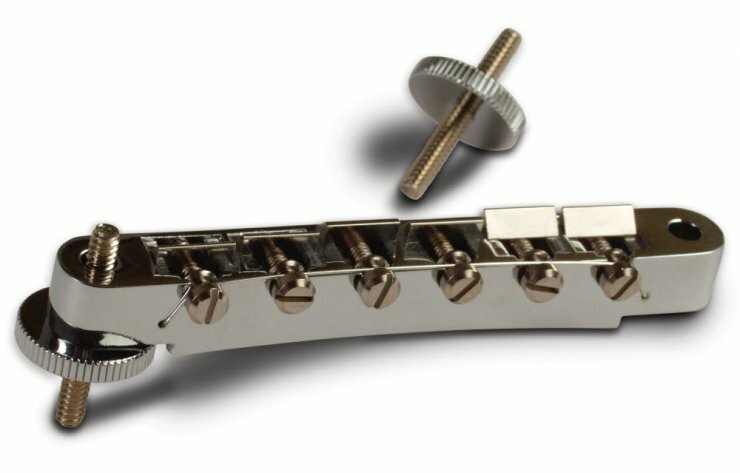 By adjusting the thumb screws on the tune-o-matic bridge you raise and lower the bridge and also the height of your strings from the fretboard. An easy mistake is to lower the bridge too much and then you have a lot of feat buzzing. I recommend having the action high enough that there are no buzzing. You may have some areas that are problematic and the frets may need to be filed to remove the buzzing but this is left for professionals or junk guitars. okay my guitar has the same bridge, but how can you move the bridge up and down without removing the strings? thanks, i didn't know how to properly do that. thank!! i always have mixed which way to move the screw, when it´s flat or sharp. now i know!